Home » Archives » 1940s Dunfermline College of Physical Education: We’ve Found Another One! 1940s Dunfermline College of Physical Education: We’ve Found Another One! Last week I was having a chat with our conservator Emma Davey who sits at the desk next to mine. In passing she mentioned that she thought her Grandmother, Bettina, went to Dunfermline College of Physical Education in the 1940s before becoming a P.E. Teacher. Towards the end of the afternoon I suggested we go and have a quick look in the DCPE archives for anything that she could take a copy of and show her Granny, when she visited. We didn’t expect to find much, just perhaps an idea of what she studied and a few photographs of buildings. Within minutes we found a reference to her in the Old Student Association reports about her sharing a flat with another Douglas (they shared the same surname) and getting called locally as the ‘Twa Dugs’! Another minute later and I had found a photograph of her that had been sent with her application when she was about 18. 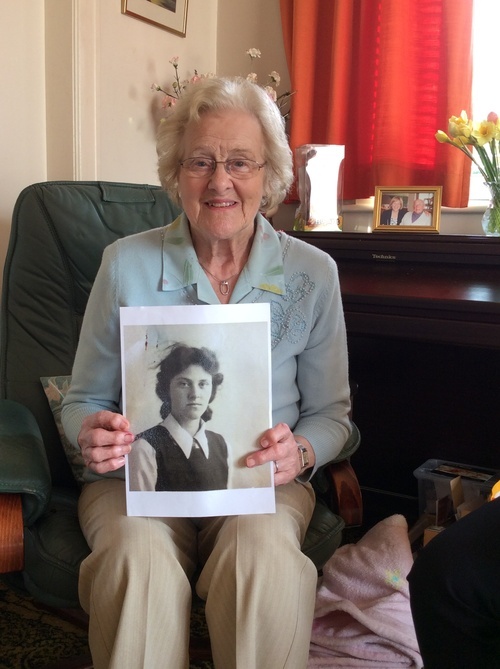 Here is Bettina with that photograph, now aged 90. She thinks the picture she is holding was taken while she was still at school and before she went to college in the early 1940s. She told Emma that she had a lot of fun at her “digs” with the other girls, and she remembers that she ended up having to oil a squeaky door in her digs so the landlady wouldn’t hear them coming back from the “local hops”! Thanks to Emma and Bettina for sharing this with us!